Originally developed by Ontech RD in Spain, the Icarus Mechanical Box Mod is a sweet looking bottom-feeding squonk mod constructed out of aluminum. Powered by a single 18650 battery, it has a huge 8ml PE bottle for hours of vaping pleasure (with compatible BF atomizer), and the replaceable engraved cover plates are available in several attractive colors to give it a customized look. 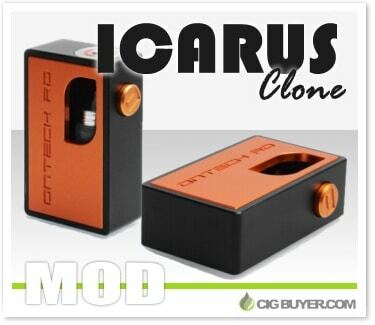 The Icarus Mechanical Mod includes an engraved firing button, large view window and squonk-compatible 510 connection.